This was our third year installing pedal powered art at The Big Chill so we really wanted to go all out and create something unusual. 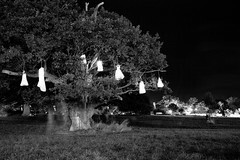 So inspired by William Blake’s ‘Vision of Angels’ we hung white dresses in an old tree, each dress contained a low voltage bulb connected to the Bicycle generators. Its looked really macabre and worked well with the Big Chill’s Zombie Theme. 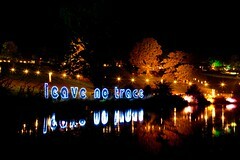 We also made a new 'leave no trace' sign that contained 1200 LED light. Each word was connect to one of three bikes on the other side of the lake! It was great to see the sign come to life at night as people pedaled the bikes. We've already got our thinking caps on to do something even better for Big Chill 2010.